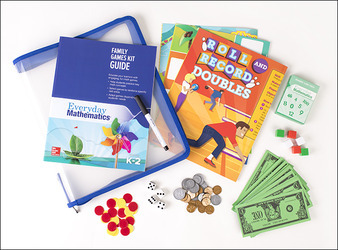 Make math fun at home with Everyday Mathematics Family Games Kits! These take-home collections allow families to play an active role in their children’s math education. Familiar games and math strategies help parents reinforce the knowledge children gain in the classroom. The Family Games Kits are packaged in grade spans and feature a sampling of games appropriate for each grade. Each kit comes with a zippered pouch for easy storage, gameboards, game pieces, and a Family Games Kit Guide, which gives instruction for all games in the kit.